By The Lite Mfg. Co. Inc. Size Large. 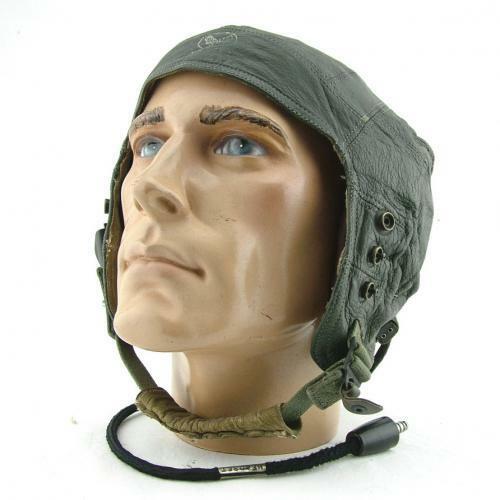 Grey leather helmet with soft chamois lining. Manufactured with press studs for oxygen mask attachment and fitted with H-71/AIC wiring loom/receivers. Webbing chinstrap with padded chamois section. The leather is clean and supple and the lining has only fairly minor soiling. Fitted with an oxygen mask clip (flat hook). Fading US Air Forces decal to forehead. These were generally used between the late 1940s and mid 1950s. Stock code H21392.